Demonstrate technical proficiency and artistry on their primary instrument or voice. 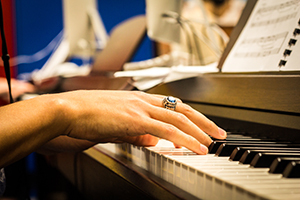 Understand music in depth through the study of music literature, history, theory and research. Enrich their community through music performance, education and/or scholarly activity. All students majoring in music must complete the courses listed below, each with a grade of "C" or better. They must also demonstrate proof of keyboard skills by passing a piano proficiency test administered by the Music Department. Or an equivalent experience approved by the department a priori.